December 4, 2018 – Ettrick, Va. — Virginia State University is pleased to announce a $25,000 donation from the Smithfield Foundation, the philanthropic arm of Smithfield Foods, Inc., to fund student scholarships. Since 2016, Smithfield has donated $75,000 for scholarships at Virginia State University, providing support to more than 30 students. 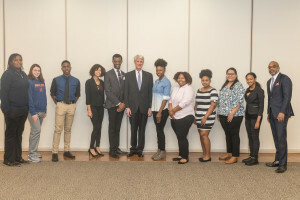 Photo caption: Vice President and General Counsel for Smithfield Foods Mr. Michael D. Flemming (center) and Virginia State University President (VSU) Makola M. Abdullah, Ph.D. (far right) take a photo with some of VSU students who are Smithfield scholarship recipients.